At the risk of angering a mob of Windsor Terraceans and Kensingtonians by blowing up their spot, I'm putting it out there that if you aren't brunching at Hamilton's, you need to remedy that ASAP . . .
Once upon a time I was a girl who lived for brunch. I still love the sweet/savory/decadent combos that are so at home on a brunch menu. What I don't love are the ridiculous prices--come on, it's scrambled eggs!--and the waits. When you have an infant and a toddler those days when you could roll out of bed at noon to join a two-hour brunch line are long gone. These days if we go out for brunch we get their right when the place opens, eat and leave before the crowds descend. We showed up at Hamilton’s at around 11am on a Saturday and were able to score a prime outdoor table. They’re a kid-friendly spot and have a ton of high chairs on hand and best of all the menu is super reasonable. 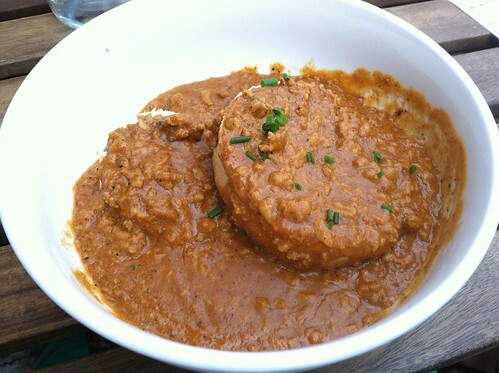 The Chorizo Biscuits & Gravy ($10) was a hearty, tomato-ey version of your classic biscuits ‘n’ gravy. Hand rolled biscuits were light and fluffy—I wouldn’t have minded a side of these on their own, perhaps with a bit of jam. 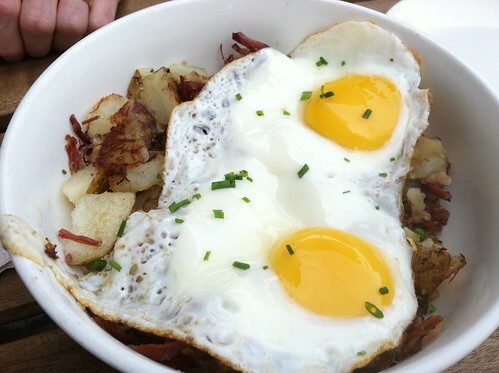 The Beef Hash & Eggs ($11), corned beef, potatoes, onion, sunny side eggs, was another substantial plate that was commended to us by our waitress. It was substantially better than another hash dish we recently had at a popular (and pricier) brunch spot in Carroll Gardens. Hamilton's is great for dinner too. It's just a bus ride up from where we live in Sunset Park. I had their orzo and it was so creamy and buttery, with sundried tomatoes. Ugh, I want to go back right now. They also have a bunch good beers on tap. Their menu is the bomb. 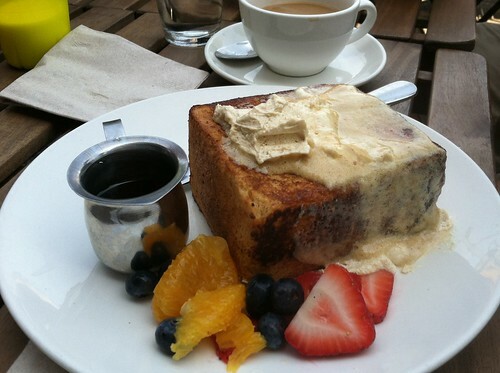 But this french toast. Wow. This french toast looks amazing.